A nurse is here every morning by appointment. She does blood tests, ECGs and blood pressure tests. She can offer immunisations, ear syringing and dressings. The nurses are pleased to advise and support smokers who are trying to quit, weight losers, or anybody interested in healthy lifestyle advice. They also undertake follow up care of people with high blood pressure, heart disease, asthma and diabetes. 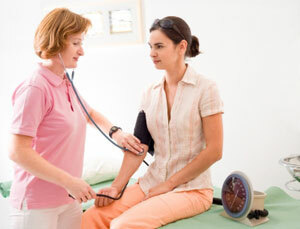 The Health Care Assistant undertakes blood tests, BP checks, ECGs and other basic health checks. The practice has a highly trained Nurse Practitioner who specialises in chronic disease management including diabetes, asthma and heart disease. She is also able to deal with minor injuries and repeat contraception. We usually send patients to Dumfries and Galloway Royal Infirmary. Some may use the Galloway Community Hospital especially for investigations. We can also refer to Ayr hospital for certain conditions. Please discuss this with your doctor at the time of referral. If you feel you have been waiting longer than you expected for a new appointment or a follow up please let us know we can check out when you will get seen. Is offered jointly by midwife and GPs with hospital backup. Women aged 20-60 years are invited by computer recall, usually every 3 years. Smears are usually carried out by the Nurse Practitioner, or a Practice Nurse during normal surgery times. We encourage all women, even if not needing a smear, to see the Practice Nurse who teaches breast awareness. All women aged 50-65 also receive an invitation to the Mobile Breast Screening Unit every three years. If you require any vaccinations relating to foreign travel you need to complete our Travel Advice form which is available at Reception. This will include which countries and areas within countries that you are visiting to determine what vaccinations are required. Once this has been completed, a GP can determine which vaccines are required and generate the necessary prescription. An appointment can then be arranged to have these administered by one of our Treatment Room nurses. If you have diabetes, we would like to see you on a regular basis (about every 6 months) to ensure that your condition is stable and keep a track on your other risk factors. Our Nurse Practitioner runs a specific clinic. If you have COPD you will be invited to see our Nurse Practitioner (who also runs this clinic) on a regular basis. Clearly some of these may be difficult to achieve; please feel free to discuss your care at your next appointment. We aim to treat people with asthma to get them as free of symptoms as possible. Using your blue inhaler more than 5 times a week. If you wish to discuss your asthma management please make an appointment with your doctor or the practice nurse. (Please bring your inhalers). Even if you are happy with how things are please book in at least every year or so, we can update your medication as things change with time. We have good links with the local mental health team. Depression is a common problem and often goes unrecognised; if you feel that you are depressed please tell us. We have access to a wide variety of information leaflets and details of self help groups. Please ask if you would like to take information away with you. The Cairnsmore Medical Practice offers the following services under the General Medical Contract (2004). Influenza Immunisation for those in the 65 and over and other at-risk groups.